These Midnight Chocolate Cupcakes are the perfect recipe to make if you’re in the mood for a very dark, chocolate cupcake. They get their name from the fact that they’re almost pitch black in color. They’re based on a much loved Betty Crocker recipe for Black Midnight Cake (which has been in dozens of Betty Crocker cookbooks over the past several decades). 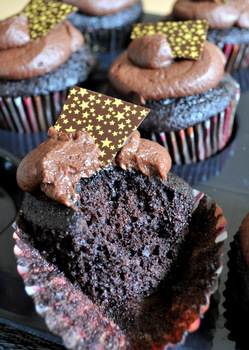 The cupcakes deliver as much chocolate as they promise with their dark coloring. They are moist, fluffy and pack a lot of flavor into every single bite. The recipe has slightly more sugar than many other cupcake recipes, but that sugar helps to keep the cupcakes moist and tender, and also adds much needed sweetness to the very large amount of cocoa powder in the batter. I typically add a small amount of instant coffee to highlight the darker notes of the cocoa powder, but that can be omitted if you prefer not to have a hint of coffee in your cake.Â The finished cupcakes are not too sweet, even when generously spread with chocolate buttercream frosting. These cupcakes are also made with shortening, rather than butter. Shortening is also used in the old BC recipe (in my 1950s-era cookbooks) for this type of cake. The shortening, like vegetable oil, helps the cakes to retain moisture and stay fresh and soft for several days after baking. Since it doesn’t add any flavor of it’s own to the cake, unlike butter, the chocolate flavor also seems a little more pronounced than it does in some other recipes. All that said, you can substitute butter back into this recipe with no problems whatsoever and still end up with a great chocolate cupcake. 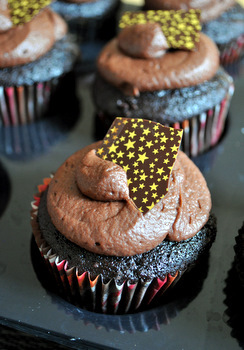 I topped my cupcakes off with a simple chocolate buttercream and a square of star-spangled chocolate. The buttercream also has a rich chocolate flavor, even if it isn’t as dark in color as the cake. I used a chocolate transfer sheet – a sheet of acetate with a colored cocoa butter design printed on it – to make my starry night garnish. A few chocolate sprinkles would also make a lovely way to finish these off. In a large bowl, cream together shortening and sugar until light and fluffy. Beat in eggs, one at a time, followed by vanilla extract and instant coffee (if using). With the mixer on a low speed, blend in 1/3 of the flour mixture, followed by half of the water. Add another third of the flour mixture, followed by the rest of the water.Â Stir in remaining flour mixture just until no streaks of dry ingredients remain. The batter should be fairly liquidy. Bake for 20-25 minutes, until a toothpick inserted into the cake comes out clean and the cakes spring back when lightly pressed. Turn cupcakes out onto a wire rack to cool completely before frosting with chocolate buttercream. Combine all ingredients except the sugar in a large bowl and beat until very smooth. Gradually beat in the sugar until the frosting is smooth, thick and fluffy. 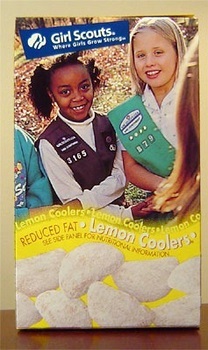 Previous PostPrevious Girl Scout Cookies: A Survival Tool? Possible to replace the shortening with normal cooking oil? I’m normally not a fan of chocolate on chocolate, but these cupcakes look to delicious to pass up! Nomnomnom, must be a great recipe! 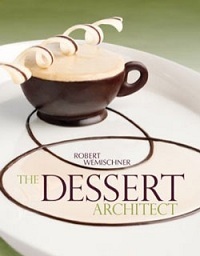 And I don’t have to be in a chocolate-mood for this (I’m always in a chocolate mood..). Definitely goning to try this soon! These would be midnight chocolate cupcakes at my house because that’s when I’d be sneaking down to the kitchen to have one more. The cocoa for the frosting, is it Dutch processed or just unsweetened cocoa? I’m a big fan of chocolate, and love cupcakes! Thanks for sharing this great recipe. I did use 3/4 cup brewed espresso instead of coffee crystals, so I omitted 3/4 cup of the water required, and replaced it with the coffee ( so everything should have turned out pretty even). Anyway I ended up using only half of my water/coffee mixture, instead of the required 1.5 cups. Hi, i love the cake part and i am trying to make the chocolate buttercream but what is 2 1/2-3 cups? Sorry im new in baking. Pls, email or reply back thank you. Meredith – This recipe does have a thin, liquid batter and needs all that liquid (I noted that it is a liquidy batter in the recipe, as well). I hope that your cupcakes turned out, but next time you might want to try with the full amount of liquid. I made this for my son’s birthday. I did not make cupcakes but a 9×9 cake. It was delicious! Also made your strawberry buttercream icing, fab! Do you have a recipe for a strawberry cake that does not need the strawberry Jello mix but has a good strawberry flavour? I live in the UK and cannot get ahold of it. I have also made your hostess cupcake recipe with the vanilla filling and people went mad over them. I use your site frequently, most of the recipes turn out fabulous! Keep up the good work and thank you. Can I use vegetable oil instead of shortening ? Just finished baking these cupcakes with lard because that’s what happened to be in the cupboard and they are light and delicious!